Next month, we will have to dodge more than just spring breakers on local roads. Once again the Corpus Christi Fire Department will be at major intersections with their “Fill the Boot” campaign on behalf of the Muscular Dystrophy Association (MDA). So be careful as you drive. Although MDA has had a controversy or two, let’s assume it is a worthy cause. Certainly we should want to help those with muscular dystrophy and do what we can to combat this disease. But, do the ends justify the means? Let’s look at the means used by the local fire department during their “Fill the Boot” campaign. In already busy intersections, firefighters roam right on the edge of traffic and even in the midst of cars carrying about their boots to fill. Anyone who has driven much in Corpus Christi knows that these intersections are often not easy to navigate. Yet, I’ve more than once experienced firemen making it even more difficult. Not only are the well-meaning firemen hazards to avoid, but they increase the visual busyness of intersections. Certain intersections – especially along South Padre Island Drive – are busy enough already! The presence of firemen all about increases the number of things a driver must be aware of and avoid. Intersections become much more complicated to navigate. The firemen, therefore, increase the likelihood an overwhelmed driver will miss something, make an error, and have an accident. That’s not to mention the hazard to the firemen as well. One year, I was waiting for a light at Waldron and SPID. 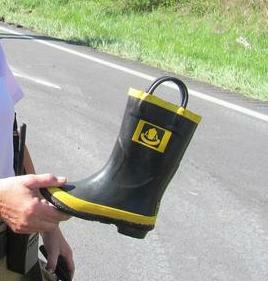 I was aware of the “Fill the Boot” campaign around the intersection and was that much more careful and alert. When the light turned green, I began to put on the gas when a fireman darted right in front of me. I jammed on the brakes. Fortunately, no one was run over, and there were no collisions. But, what if I had been slightly less alert? What if my reflexes were slightly slower? What if the person behind me was on mental autopilot and rear-ended me? Again, MDA may be a very worthy cause, but would we tolerate traffic hazards increased for any number of other worthy causes? Would we tolerate private organizations roaming in and around intersections for their favorite causes? I would not; the city should not. No city agency should so endanger the driver or the firemen. Other cities and counties around the state and across the nation, including Oklahoma City, Oklahoma, Palm Beach, Florida, and Charleston, S.C, are taking the “Fill the Boot” campaign off the streets due to safety concerns. Corpus Christi and Nueces County should, too.